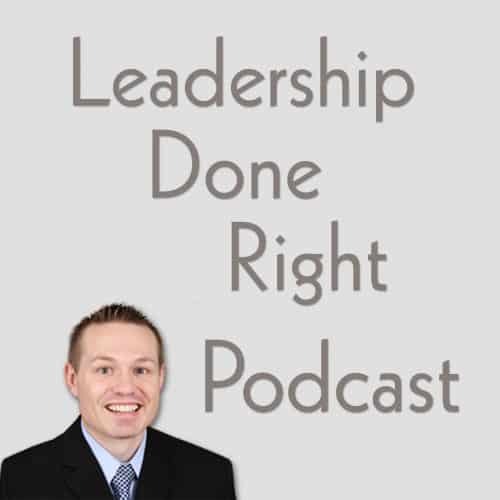 Hello and welcome to the Leadership Done Right Podcast, Episode 5 – SMART Goal Setting for Leaders. In the first episode of this podcast, I explained that great leaders set goals. In this episode we are going to take a deeper look into SMART goal setting. Have you ever wanted to do something great, but didn’t know what steps to take or where to even start? Or, have you ever wanted to accomplish something and waffled back and forth until you lost your way? Or have you started down a road working towards an objective and little by little other things crept into your life until you were way off course? Well, if you have ever gone through any of these experiences, you are not alone. Many people experience these challenges every day. Although these challenges happen everyday, there is one thing you can do to overcome them. You can set SMART goals. In this episode, I will teach you what you need to do to set effective goals. First, it is really important to set the correct type of goals. The framework you use in setting your goals is very important because the wrong framework can lead to frustration, discouragement, and anything but success. On the other hand, when you set up the right framework, your goals are ensured to be successful. So what is that correct framework? I like to do SMART Goal Setting. It is very important to set very specific goals. It is easy to set a lofty, “up in the air” goal that cannot be understood. A goal that is not specific and “up in the air” is ambiguous and leads to confusion. An example of this type of goal would be to say, “We want to make the organization better this year.” How will you make the organization better? What changes will you make? How can you know if you reached your goal if you don’t know what your goal is? Specific goals explain exactly what you want to do and how you are going to do it. In line with the goal mentioned above, what will you do to make the organization better? Will you increase profit by 20%? If so, how will you increase the profit by 20%? A specific goals would sound more like, “This year we will increase the profit by 20% by eliminating down time between shifts.” From there you would set specific subgoals that would break down how you would eliminate the down time. Each goal would be very specific. When a goal is measurable, it is quantifiable. In the example above, the increase in profit by 20% is a measurable quantity. 20% is a measurable amount. If your goal is not measurable, how will you know if you achieved it or not? You won’t. As the quote mentioned, you should not set a goal that is far beyond your capacity. Achievable goals are challenging and force you to stretch but they are not beyond reach. Achievable goals promote growth and progress. If you set unachievable goals, you will never reach your expectations which could lead to discouragement. Set goals that are within your control so they are achievable. Goals need to be realistic. For example, if you have never written a computer program and you set the goal to write five programs in the next week, it is probably not a realistic goal. Instead, make goals like signing up for a computer programming class, buying books to begin learning the programming basics, meeting with other programmers to pick their brain, or like goals. These goals will get you on the path so that you can eventually write five programs in one week. Set goals that are realistic so you can achieve them. Do you have long, middle, and short-term goals? Timely goals have a specific deadline or time period in which they must be completed. 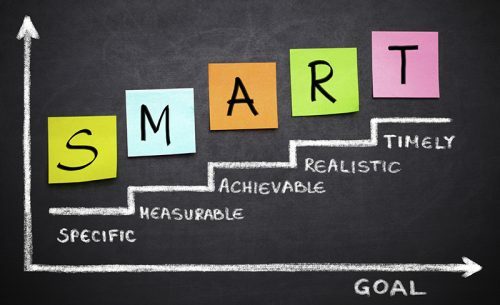 If you do SMART goal setting but forget the time frame and date for completion, you will most likely fall short. Once you’ve set SMART goals, here are five steps to keep your goals on track. While reviewing them, look at what you are doing to achieve your goals and identify if your current actions are keeping you on track. If you find that you are on track, keep working hard to move forward. If you are starting to get off track, adjust your life to get back on track or modify your goals to better suit your life. Life happens and goals can change. Goal setting can be very painful or you can do SMART goal setting. If you set SMART goals, you will be far more likely to see consistent improvement regularly because you will have specific targets. I have found that as I have set SMART goals for myself and others, the goals have been more challenging and rewarding at the same time. They have forced me to exert more effort and try harder.